Setting a status within Win Bus Messenger is easy as pie (mmm pie).. 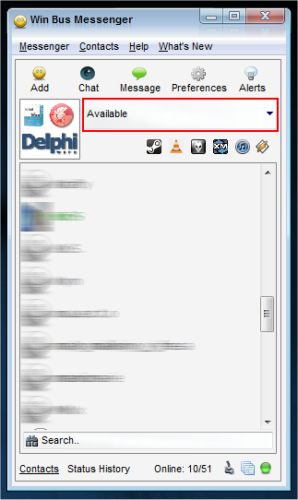 In the Win Bus Messenger program, once logged in, you will see the status editor below highlighted in red..
You can simply click the arrow towards the right to drop this down, where you can select from the predefines statuses. The default status will be "Available", and you will go "Idle" if you do not use your computer for over 10 minutes!